Trdelník is a traditional sweet bread shaped like a large hollow cream horns, but without the cream filling. 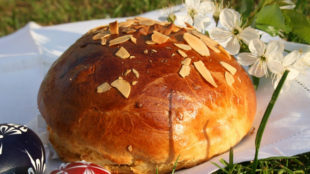 It is made from a yeast dough that is rolled up in strips on beech or metal cylinder with a diameter of 8-10 cm and baked in the heat of charcoal. It rotates during the baking and smears with milk, until it obtains a golden reddish colour. Then it is carefully removed from the cylinder not to break the shape. Mix the yeast with spoonfuls of lukewarm milk and a pinch of sugar. Let come leaven. Of all the raw materials and hammered sourdough prepare a soft dough, which leave in a warm place to rise for about 30 minutes. Roll out thin pancake from the dough, cut it into strips and dragging them around some cylinder (e.g. tube for cream horns or preserving jar). Smear the Trdelník with egg, oil or milk and coat in cinnamon sugar. Bake in a preheated oven at 180 ° C for about 8 minutes. After baking, carefully take off the tubes. It is best when it is still hot. The website Czech Gastronomy will introduce Czech cuisine but also the Czech Republic.